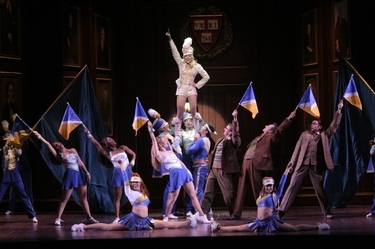 Laura Bell Bundy in the Broadway production of Legally Blonde, the Musical. Copyrighted photo courtesy of Barlow-Hartman Public Relations. How's this for football counter-programming: MTV is reshowing the Broadway production of Legally Blonde the Musical, this time in a sing-along format, at 1 p.m. Thanksgiving Day. The show, starring Lexington's Laura Bell Bundy as SoCal sorority girl-turned-Harvard law student Elle Woods, will play with lyrics at the bottom of the screen. It's been a successful technique with tween hits such as High School Musical. MTV and Legally Blonde broke new ground in October by being the first Broadway show ever to be shown on TV in its entirety while it was still running on Broadway. According to Playbill.com, between the initial Oct. 13 showing and subsequent airings on MTV, Legally Blonde was seen by more than 12.5 million viewers. Funny thing is, unless there's a real quick resolution to the Broadway stagehands strike, TV is the only way you'll see Legally Blonde Thanksgiving weekend. Thanksgiving morning, Bundy and the Blonde cast will perform on the broadcast of Macy's Thanksgiving Day Parade, which starts at 9 a.m. on NBC. ~ The Dunbar High School Marching band will be in the Macy's Parade -- maybe they should just hold the thing in Lexington, don'tcha think? 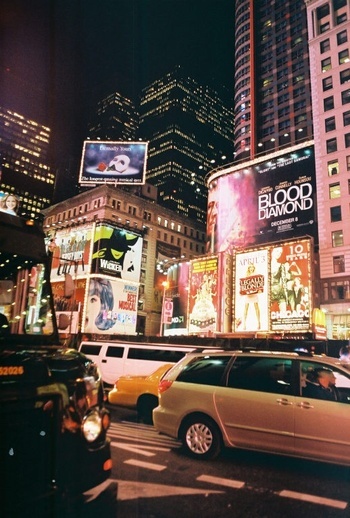 Keep up with the high schoolers adventures in the big city on the blog, March of a Lifetime. ~ The University of Kentucky Symphony Orchestra's big Carnegie Hall appearance with Arlo Guthrie is Saturday night. Watch the Herald-Leader over the weekend for photos and a story on the big event. 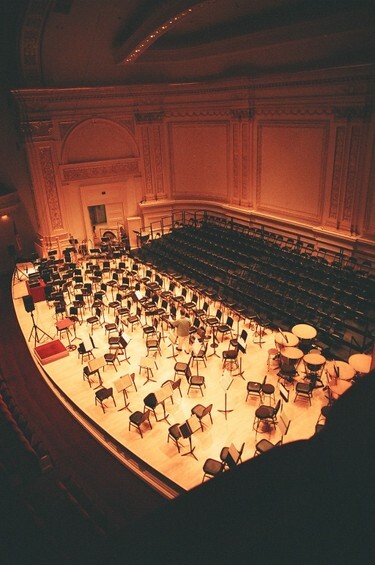 The acoustics in the legendary Carnegie Hall make you wonder how an orchestra could want to perform anywhere else. New York envy is easy to come by, particularly if you love the arts. No matter how busy the arts scene in Lexington gets, it will never hold a candle to the lists and lists of events that pack the arts sections of The New York Times. And the organizations themselves seem to have everything: multi-million dollar budgets, world-famous venues and the best talent on the planet. Occasionally, you might remind yourself that you’d better move to New York with a healthy salary if you want to partake in even a smidgen of this arts smorgasbord, but still, you contemplate the menu and drool, drool, drool. Over 10 days in New York as part of the National Endowment for the Arts Journalism Institute in Classical Music and Opera last month, I got to indulge in and learn about that scene with a depth I hadn’t before. And while it was thrilling to go to shows night after night and talk about music all day long, it was most intriguing to learn that things are not always as idyllic as they seem in the Big Apple. This was particularly striking when discussing performance spaces. Legit Lexington talents Laura Bell Bundy and Lyndy Franklin will present a Christmas concert with the Bluegrass Jazz Ambassadors at 7:30 Dec. 10 at the Lexington Opera House. Tickets are $15-$35 and go on sale at 10 a.m. Friday. Bundy is starring as Elle Woods in the Broadway production of Legally Blonde, and Franklin is the dance captain and understudies several roles in the Broadway revival of A Chorus Line. Last December, in the midst of rehearsals for Legally Blonde, Bundy came home to present a concert with the Jazz Ambassadors at Memorial Hall, with whom she recorded a CD, I'll Be Home for Christmas. Bundy and Franklin are longtime friends who actually spent last Christmas day together in New York. 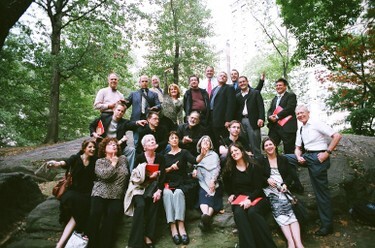 The fellows from the NEA Institute on Classical Music and Opera in Central Park. Too many to name by name, but they included six daily paper scribes, including me; a defense policy analyst by day and music critic by night from Washington; Gentleman Jim from Montgomery, Ala., and Valeria from Hawaii. Notice, I'm not the only one in a bow tie. It is good to be back in Lexington. That's a typical thing for a weary traveler to say when he gets back to familiar territory. But considering my journey home included a canceled flight, two-and-a-half hours sitting on the tarmac at LaGuardia and a very aerobic trot through Hartsfield Airport in Atlanta to make my connection to Lexington, it is really good to be back, though I already miss my fellow fellows. All of us are returning home with a lot to think about. 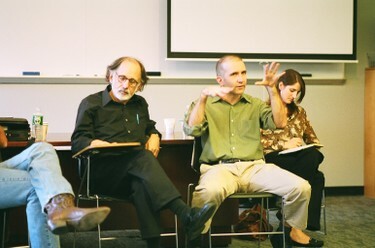 Joseph Horowitz and Alex Ross, L-R, discuss contemporary music at Columbia University. Some of the reading we did before the fellowship, particularly by Joesph Horowitz and Alex Ross had me thinking about things that led to other posts on this site, including the changing role of the conductor and re-examining concert etiquette. ~ I come away from it thinking about our roles as music writers and critics. Are we best serving readers with what we are doing? What can we do better? What is out obligation to the art form itself? ~ What about this thing we call "classical music," usually for want of a better term. How's it doing, and where is it going? ~ What is the role of classical music in our larger communities? 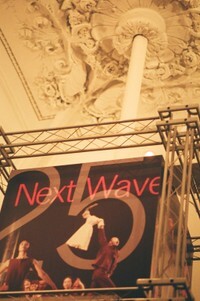 ~ Is new and recent music getting a fair shake in our concert halls? If not, why not, and how important is it that new music be heard? ~ It is very easy for the rest of the country to develop an inferiority complex about New York. But what's the quality of that quantity? Are we, here in Flyover Country, actually better poised to be innovative than the big cities? And, back to we, the journalists, what is our role in encouraging that innovation? We're not going to answer all those questions today, and I'm not just saying that because I'm tired. But many, if not all of these questions, are things for us to examine here in Central Kentucky, particularly at such a fluid time in our classical music scene. ~ Sitting on the tarmac in New York, I entertained myself for a while listening to the Delta classical music channel (it's No. 5 if you're traveling soon). I was particularly taken with Canadian Kelly-Marie Murphy's Give Me Wings to Fly, performed by the Gryphon Trio. Listening the entire album, Canadian Premiers, I experienced love at first listen with Old Photographs for Piano Trio, by Christos Hatzis. 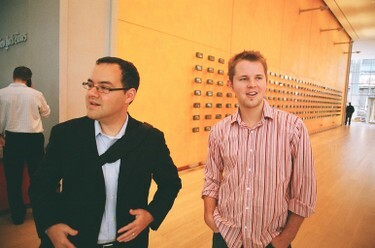 The Washington Post's Daniel Ginsberg and the Chicago Sun-Times and TimeOut Chicago's Bryant Manning in the lobby of The New York Times. By the way, Typepad, the company that supports this and reams of other blogs, has an good interview with Alex about his blog, also called The Rest is Noise. And I just learned NEA fellow Suzi Steffen had an excellent interview with Alex, also. ~ Here's some more NEA Institute blogging from Brenda Tremblay of WXXI radio in Rochester. OK, I'm starting to get the feeling I'm rambling, like many tired people do. But we'll keep talking about these things, and really, it is good to be home. 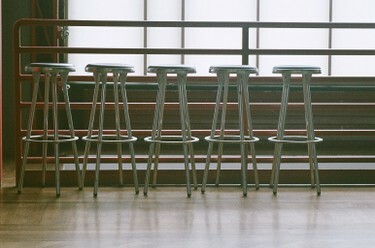 Stools in the cafe at the Brooklyn Academy of Music, illuminated by the muted light of a rainy Friday afternoon. Among the many amazing things I could mention about the NEA Institute in Classical Music and Opera is this: We have been amazingly busy. Even over the weekend, between shows we were seeing, things to write for the institute and what some of us call "work work," there hasn't been time for much else. But y'all back home will get the benefit in a reporter totally psyched with new ideas and a new sense of mission. The day after hearing about the Downtown Entertainment Development Task Force in Lexington, we made our first trip off the Island of Manhattan to visit the Brooklyn Academy of Music. And looking at BAM was quite intriguing in the context of hearing about a serious proposal to develop an arts district back home. 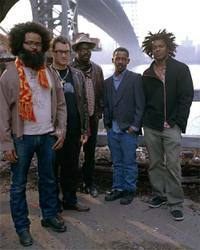 BAM is an institution which has become a major force in its community as well as the nation. Part of the intent of the Academy is drawing audiences in through as many avenues as possible, from events at the opera house to movie theaters in the facility, which roll arthouse fare such as Into the Wild and The Darjeeling Limited. And the multi-venue facility is looking to expand. During a Q&A with president Karen Brooks Hopkins and executive producer Joseph V. Melillo, with the new Lexington proposal fresh in my mind, I asked about facilities with BAM sensibilities around the nation -- Ohio State's Wexner Center came up -- and if they consult with other facilities, which they do. But the most interesting moment was as we departed. Melillo leaned over to me and said, "You've got a great guy in Lexington. Jim Clark. He knows all about BAM." Certainly, I haven't talked to anyone about this proposal, and I am well aware Lexington has to accomplish its own vision of an arts and entertainment center. But Melillo's comment was a reminder we have a guy in the process with a grasp of the possibilities. ~ Thursday was Carnegie Hall. 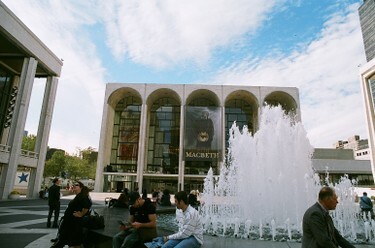 The Metropolitan Opera House on Tuesday afternoon. William Wegman's dogs have been part of the Opera's promotional campaign this year, including the banner for Macbeth. Take a pretty long opera to begin with, add an 8 p.m. curtain and two super-long intermissions, and you have the red-eye edition of Copious Notes. But they just said MuteMath is on Conan, so I'm up until at least 1:35. Anyway, our first -- and thus far only -- consensus disappointment at the NEA Institute in Classical Music and Opera was that Natalie Dessay did not sing the title role in Lucia di Lammermoor last night. We learned that Tuesday morning in a class with Columbia University assistant music professor Karen Henson, where she casually mentioned that Natalie wouldn't be singing Wednesday night, and then proceeded to bring her up at least half a dozen times during the two-hour session. "Natalie this," "Natalie that," "You know, Natalie is really good a mad scenes." Really? Because, you know, Lucia has one of those. Anyway, I know Karen wasn't trying to pour salt in the wound. She was simply using one of the great acting sopranos today as an example in a class, even showing Natalie's mad scene as Ophelia in Ambroise Thomas' Hamlet that was so incredible, I've already ordered the DVD. Karen also had a little aside about the current trend of "Opera heroin chic," riffing off the high-contrast and emaciated look of models just a few years ago, in ads such as the banner (photo, right) of Dessay for Lucia. Anyway, for an out of towner, no night at the Met is a bad night at the Met. So, last week, I was try to drum up some sympathy around the office, but it wasn't working. See, I'm going to be missing a bunch of stuff around the Bluegrass, like Friday's opening night performance of Hamlet at Actors Guild and Rent's return to the Opera House. 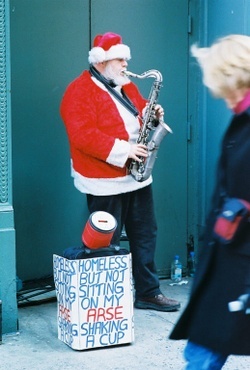 But somehow, I haven't been able to sell this poor, poor pitiful me act. In fact, when I tried to bring it up at features staff meeting last week . . . well . . . I can't remember if any of my polite colleagues said, "shut up," but I know a few were thinking it. We had our first meeting last night, and I have to say it was fun to brag on Lexington for a few minutes, mentioning that we had just come off a week of a thrilling concert by Kronos and a world premier performance of Thomas Pasatieri's new opera, and that in less than two weeks the search for the Lexington Philharmonic's new music director gets under way. We've got it going like Stacy's mom when it comes to classical music in Lexington. That's actually one of the main reasons to be here at the NEA Institute in Classical Music and Opera at Columbia University. With so much going on, it's a great time to sharpen the skills and work to bring you better coverage than ever during this exciting time in Lexington culture. It's a tense trip. They've tried to pack a bunch into our schedules, so I don't know how much I'll post this week. But if anything really cool happens, I'll try to send you a blurb, particularly after our singing lessons -- imagine 23 music critics singing together . . . even we shuddered at the thought. ~ Notes from the airport: It was sort of funny seeing all the LSU fans in purple and yellow at Bluegrass Airport yesterday. I was thinking, "What do you say? Hope you had a nice trip, anyway?" One of the fun things upon arrival was buying the New York Times and seeing a photo of Steve Johnson's touchdown as the huge centerpiece of the sports section. Having seen Arlene Hutton's Last Train to Nibroc at Actors Guild of Lexington back in 2000, two of the really fun things about seeing the sequel, Gulf View Drive, on Saturday night were the theater and the actor playing May. The 78th Street Theatre Lab is highly reminiscent of AGL's old Short Street digs. It was up a rollercoaster-steep set of stairs and the theater itself was essentially a little shoebox. It was also an extremely engaged crowd of, from what I gathered, mostly New York Theatre goers. And the house was packed, with patrons tucked in the corners around the stage, buoyed apparently by The New York Times rave review. Gulf View was the third of a trilogy -- Nibroc, See Rock City and Gulf View -- and last night's show capped a performance of the trilogy that had stared that afternoon. (Wonder if local audiences would go for that.) When Hutton asked how many in the audience had been there for the whole day, a good third to half of the hands shot up. They got a door prize: a recipe for Mrs. Brummett's sweet summer squash. Did you ever think New York City theater would be so down home? It was also fun to hear things like references to Berea College and think, "I know what that's about." I mentioned May. 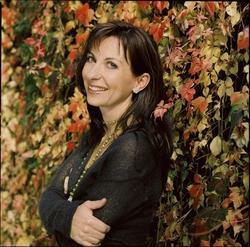 Alexandra Geis was the original May in the 1999 debut production of Nibroc, and she was strikingly similar to Rachel Rogers, AGL's May. Granted, they were playing the same role, but there were also similarities in appearance and mannerisms that were fun to note. We're getting together with Hutton tomorrow, and will have more on her in the Gutenberg edition of the Herald-Leader and Kentucky.com, soon. As for today, it is the big day for Laura Bell and Blonde. So, before things start hopping, I'm heading out for a New York morning of coffee, bagels and The Times. Everyone is in top form in the Harvey Schmidt-Tom Jones musical based on N. Richard Nash's play, The Rainmaker. 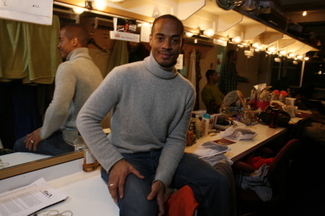 Kazee plays Starbuck, so his job is to come out exceedingly confident and charismatic and own the stage for most of his scenes, which he does. Kazee's look has changed quite a bit for the role as his strikes a somewhat messianic pose compared the photo to the right. McDonald, by the way, is heaven to hear live, and her acting is quite impressive, and Cullum's role was reminiscent of his Northern Exposure character, Holling Vincoeur. Read more about Kazee and 110 in next Sunday's Herald-Leader and Kentucky.com. NEW YORK — It’s a small world, and in The Color Purple, actors Eric L. Christian and LaVon Fisher-Wilson found out Broadway is even smaller. Both attended Louisville’s Youth Performing Arts School, Christian a few years ahead of Fisher-Wilson. “He was the hot-shot senior,” Fisher-Wilson, who graduated from YPAS in 1991, says of Christian, who was in the class of ’89. After graduation, they took divergent paths from Louisville to Oprah Winfrey’s big Broadway production. But now, they are together again backstage at the Broadway Theatre. Both are swings, meaning they understudy several roles in the show. “It’s the first original production that I have been an original cast member in,” Christian (photo, right, by by Aaron Lee Fineman, backstage at The Color Purple) says of the show, which celebrated its first anniversary Dec. 1. “That’s exciting because you get to work from the bottom up, creating all of these things. Fisher-Wilson joined the cast in September. But they did, and Fisher-Wilson (photo, left, by Aaron Lee Fineman, backstage at The Color Purple), who has taken a long journey to her Broadway debut, says, “It’s my dream I kept deferring and doing other things. I think I was supposed to do other things because I am glad I am the age I am and have the mind-set I’m in because I am very focused and driven about what I am going to do.” Fisher-Wilson continues, “Also, I could have been put in any cast, but I wound up in this one. The love and care of Kentucky keeps drawing me back to my family, and I get that here with this cast. Part of the reason Fisher-Wilson kept deferring the dream was that she always wanted to move back to Kentucky. After graduation from YPAS, Fisher-Wilson went to Millikin University in Decatur, Ill., for her bachelor’s degree and then to the University of Florida for graduate school. After that, she embarked on a touring and regional theater career. She was frequently tempted to move to New York but was a little timid about making the leap. One thing she was doing and still wants to pursue is creating youth arts programs in Louisville. 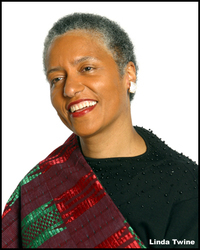 For several years, she ran Ujamma, an African dance program for girls. 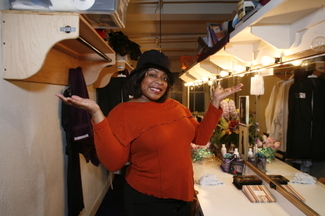 Part of the motivation for heading to New York was that to get grants at the level she needed, she needed to have some Broadway credits on her résumé. It also helped that she met her husband, who is from New York, though he is now with Fisher-Wilson in her desire to eventually move to Kentucky. “I am on this journey, and we will see where it takes me, but eventually, the journey will lead back to Kentucky,” she says. He’s now been in the city 12 years, performing in the Broadway productions of Hairspray and The Lion King, in which he understudied Simba, as well going on several national tours. He is actually a Lexington native and attended Meadowthorpe Elementary School before he moved to Louisville in sixth grade. Christian got his first taste of stage work at a Lexington Children’s Theatre’s summer program. His tuition for that and several summer theater programs was supported by the Chittenden family, which he considers the “guardians” of his theatrical development. New York Times theater critic Charles Isherwood had a column in the paper Dec. 10 that piqued my interest, having just returned from New York. Headlined “The Great White-Bread Way,” the piece was something of a lament for the old Broadway experience, before the “Disneyfication” of Times Square and its adjacent blocks to attract more tourists. Broadway, Isherwood pointed out, used to be a seedier neighborhood where serious theatergoers, the vast majority of whom were New Yorkers, had to trip over colorful characters to see shows. (An aside: Aaron Fineman, the New York photographer with whom I worked on my trip, and I were amused by a line in the Chorus Line revival that refers to the 42nd Street of old, and we guessed that younger folks probably won’t get it.) Now, Isherwood says, Broadway plays to a decidedly different crowd that treats shows as just diversions on sightseeing and shopping trips. The Broadway audience, he writes, used to be 58 percent New Yorkers. Now, only 43 percent are locals. In some ways, I’m inclined to be sympathetic to Isherwood’s point of view. Even as an out-of-towner, I share a distaste for the Times Square shopping hub loaded with a lot of stores I can patronize in Lexington — probably for less than I would pay in New York. Why should I eat at the Olive Garden in New York City when I have one at Fayette Mall? I travel to experience different things. But I also, with a bit of pride for New York, will brag that I can feel perfectly safe walking around Times Square until late in the night. 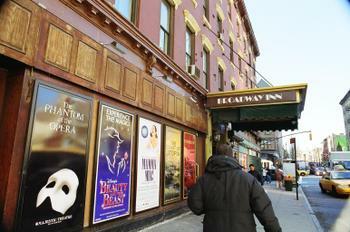 I cannot comment with any authority on the changes Mayor Rudy Giuliani brought to the theater district. But I confess I would be far less enamored of New York if walking out of my 46th Street hotel door felt inordinately risky. I have to agree that the theater-going experience in New York has its downsides. The product has changed so that you have numerous shows, such as How the Grinch Stole Christmas, that feel like pure commodities. And inside the theater, it can feel more as if you’re at a movie than a play. At my first show on this trip, The Color Purple, I was appalled at the late seating that was allowed. Three or four numbers into the performance, people were showing up. And the ushers were bringing them down the aisle and seating them, even if it meant uprooting half a dozen seated patrons in the middle of a song. Maybe when people have paid $111 a ticket, theaters are afraid to tell them they’ll need to watch from the back or sit in the lobby for half the show. But what about my $111 experience? And it was sad how easily I was able to grab a really good half-price seat to a Thursday night performance of Grey Gardens, a serious endeavor starring Christine Ebersole, one of Broadway’s most celebrated talents. Then it was sad to talk to some patrons who didn’t know who Ebersole was. The Broadway experience is still exhilarating, watching levels of talent and production you don’t experience much of anywhere else. It’s well worth a trip. But there’s a lot of ancillary noise you have to put up with now, if you’re there to see some good theater. We often are inclined to remember the past more fondly than we experienced it. Broadway.com strikes again, and this time, it's Frankfort's Will Chase we get to see in action. Will, a veteran of Broadway productions such as Rent and Lennon, is now the leading man in High Fidelity, the musical adaptation of Nick Hornby's beloved novel. Opening night was Dec. 7, and Broadway.com has posted some cool video of Will and the cast in action, as well as interviews from the post-show bash at Roseland. Click here to take a look. Update: Unfortunately, High Fidelity has been experiencing low turnout and will close Sunday, after only 14 performances and 18 previews. The show opened Dec. 7, to mostly negative reviews. The New York Times Ben Brantley put it on his list of five most forgettable musicals, adding, "Now if only I can remember the names of the others." Ouch. The night that review ran, I settled into a seat at the Imperial to see the show. It was not completely devoid of entertainment value. In fact, there were one or two quite memorable scenes, including Rob's fantasy about doing away with his rival, Ian, set to several different musical genres. But the show did miss both the appeal of a the High Fidelity story and the flavor of a Broadway musical, dooming it to not making much of anyone happy. It should be noted that when it came time for the curtain call, the audience remained seated until Will Chase burst on stage. His standing O affirms that whatever was wrong with this show, it wasn't him. I read reviews. Specifically, when I am making a hotel reservation, I devour online reviews of potential places to stay. To me, hotel reviews are really important, because you are choosing a place to leave you valuables and sleep at night while you are traveling. You don’t want to be stuck somewhere unpleasant or unsafe. Making a reservation for the New York trip I just completed reminded me of some of the ins and outs of reading a reviews -- be they of hotels, shows or restaurants -- particularly in this Internet age, where everyone's a critic. 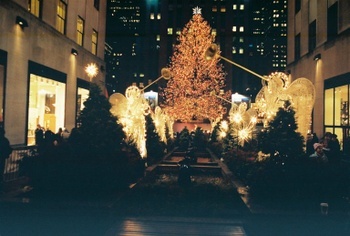 Now, some of my limitations this trip were, I was booking late and into New York City during the busy Holiday season. The Herald-Leader was happy to send me on the trip, to cover stories about several Central Kentuckians on Broadway, but asked me to keep a lid on expenses. That seemed hard to do, as when I logged onto Orbitz for Business, most everything in New York City a two-star rating or above was running over $300 a night. After a frustrating while searching the mainstream travel searches such as Orbitz and Expedia, I went searching for inns and bed and breakfasts that might be in NYC, a route that had served me well on a trip to Toronto in 2005 for the Toronto Film Festival. There, I ended up in a quiet inn, Victoria’s Mansion, that was a perfect home base for a five night stay. The best option to emerge from my New York search was a place called The Broadway Inn, at the corner of 46th Street and Eight Avenue. 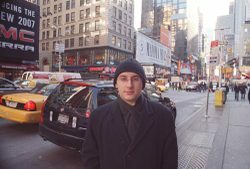 Having stayed on the Upper West Side my last few trips to New York, I really wanted to be in the theater district on this trip. The price and accommodations looked right, so I went looking for reviews. And they were mostly good, even at places like Trip Advisor and Yahoo Travel, which are good for providing unvarnished opinions of a place. But here is the hazard with things like the reader reviews at Travelocity and other places, even movie reviews at imdb or Rotten Tomatoes. You don’t know who the people are, what their standards are, what their personalities are like, none of that. So, I tend to look for a consensus of opinion and what people are saying. 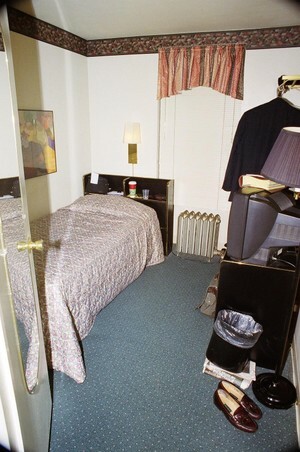 For instance, one of the first negative reviewers of the Broadway Inn was upset they pulled back the sheets and there was a hair on the bed. That was sort of the extent of their complaint. OK, it shouldn’t be there, but one hair on a sheet is not going to kill me. Another complained that he was penalized for canceling late, though the cancellation policy is clearly stated on the hotel’s website. A few other people didn’t really seem to understand New York very well, specifically that you will pay twice to three times as much as you’re used to paying for a room elsewhere and probably get half the accommodation. It’s a big city with a lot of dinky hotel rooms, and most of us shrug it off saying you don’t go to NYC to sit in a hotel room. So, anyway, user reviews were mostly positive, and I read deeper to understand what some of the complaints were. Then, I went to a few sources like Frommer’s and Fodor’s, because these are travel experts who know what to expect and what a good value looks like. I may not always agree with them, but they have track records I trust. 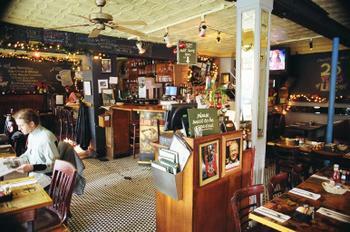 They and a few other mainstream sources I consulted all seemed say the Broadway Inn was a good option. So, I e-mailed a reservation request late one night. When I arrived at my desk the next morning, I already had a call from a woman offering me a room, including a discount on the weekend rate Friday night because I was checking in for a five night stay ($215 a night). Still, I was a little nervous because there were some negative comments. Coming into the city, I was a tad concerned my cabbie had no idea where the Broadway Inn was. But, for a budget traveler, it turned out to be a really nice option. My room (photo, right) was a shoebox, which I expected, but not so cramped I couldn’t stand it. The wireless connection was only available in the lobby. But the lobby was so cozy, I kind of enjoyed going down there each night to file blog posts. The last day I was there, the staff was even sharing a box of chocolates a customer had given them. One web reviewer, and a guest I heard while I was there, complained the continental breakfast was just pastries. But I had never stayed in New York hotel that offered any complimentary breakfast before, so I was happy. Overall, I was happy, particularly considering the money spent and time of year I was there. So I would join the rest of the net in a good review of the hotel, and I was glad I had so much information to help me decide whether or not to go there. So, I’m going to see Adam Miller Friday afternoon (Dec. 8). He’s a UK grad and Lexington native who has established himself on the management end of things on Broadway, working in the offices of shows such as Urinetown; Chitty, Chitty, Bang, Bang; Ring of Fire and now A Chorus Line. Adam gave me directions to his office on the Eighth floor of a building at the corner of 51st Street and Broadway. Nice address. But I still wasn’t prepared for the name on the door of his office: Cameron Mackintosh Incorporated. Uh, yeah, Adam has moved up, working for the guys who brought you Cats and Les Miserables. Anyhoo, it was great to chat with Adam because he is so plugged into the Broadway scene, but also keeps in touch with Lexington Theatre. 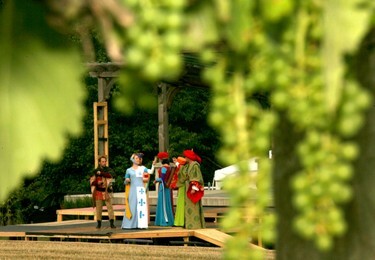 Nice to talk to a guy who can make really astute third party observations about the fate of the Lexington Shakespeare Festival and also evaluate the likely impact of Ben Brantley’s subtley savage review of High Fidelity in the Times that morning. But the interesting recurring theme was the preponderance of Central Kentuckians in New York, and even on Broadway, as most recently demonstrated by he and Lyndy Franklin both working on A Chorus Line. He recalled how they commiserated the day of the crash of Flight 5191, when they were both in San Francisco for the out-of-town preview for Chorus Line. They waited for news of whether they knew anyone on the flight and were calling back to New York to check in with other Kentuckians in The City. Broadway, Adam says, is a small community, and it is amazing, he adds, how many Kentuckians are in it. I don’t know the origins of Silver Bells' gentle refrain, “It’s Christmastime, in the city.” But it is nearly impossible to walk the streets between Herald Square, Fifth Avenue and Times Square without humming that tune. Yes, every city, including Lexington, has its Christmas traditions. 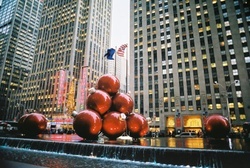 But with so many iconic holiday perennials -- the tree at Rockefeller Center, Macy’s, the shop windows on Fifth Avenue, the Radio City Christmas Spectacular, the New York City Ballet’s Nutcracker -- it is no wonder that the weeks between Thanksgiving and Christmas are the toughest tickets in New York City. And there’s a lot to be said for Christmas at Grandma and Grandpa’s farm as well as in my hometown of Virginia Beach, where the municipal version of Southern Lights stretches out along the Boardwalk with pieces like surfing Santa. 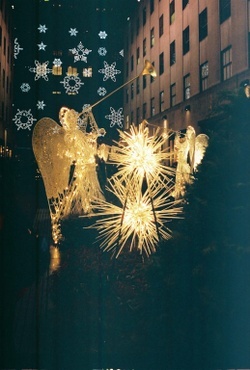 But Christmastime in The City has to be experienced at least once. ~ Riding the train down the Lower East Side Friday morning to have Breakfast at the Life Cafe (photo, right) reminded me a bit of the first time I was in Athens, Ga. I went to landmarks such as the 40 Watt Club and Allen’s Bar, highlights of the careers and lyrics of R.E.M. and The B-52’s. The 52’s Cosmic Thing album is a veritable Athens travelogue, from the second you’re heading down the Atlanta Highway. Life Cafe was made famous as the gathering place for the Bohemians in Rent. Knowing I’m a bit of a Rent-head, Aaron (the New York-based photographer I worked with last week) invited me to breakfast there, and I giddily accepted the offer. Like a lot of these iconic locales, the facility in and of itself is nothing exceptional -- except that it's a place in New York where two people can eat breakfast for under $8. Aaron (pictured, left, outside the cafe), in fact, tells me that the cafe changed locations from the time the musical portrays. Thanks to gentrification, the entire area has transformed from the urban squalor of Rent into a place Mark, Roger, Mimi and the rest probably wouldn’t recognize. But, at the Life Cafe, you do sense that spirit has endured. The staff is exceptionally nice and the establishment seems to recognize it has a place in the hearts of many people who embraced la vie Boheme. There were a few people I was tempted to call from my booth and say, “Guess where I am,” to make them jealous. I’d like to go again some evening to see what the Cafe is like in at night, though I know it's not like Angel and Collins would be jumping on the table to sing. But even if I never go back, it’s great to have been able to touch a piece of art that has touched me. ~ So, after I left a taping of Late Night with Conan O'Brien Friday evening, I needed to go, you know . . . So it seemed like the right time to finally check out those Charmin bathrooms. Apparently Charmin came up with this idea in response to the dearth of restrooms in Times Square. It was pottying as you only could in Fun City, and easily, one of the most bizarre things I have done since graduating from college. The entrance is right there on Times Square. You go up a long escalator, like you are going up to the second floor at Macy’s or another concourse at the airport. Atop the escalator, a snaking line forms about five rows deep, leading to a crescent platform that, with all the blue, looks a little like the floor at Rupp Arena. The floor is surrounded by 20, small, private bathrooms, with their own toilet, sink, soap and six rolls of Charmin toilet paper, as well as a roll of Charmin paper towels. As you walk to your room, a young attendant bellows, “You can do it!” like he was cheering on the Cats, and a smiling young lady closes the door behind you. Even in the privacy of the small room that couldn’t be much more deep or wide than a couple of feet, you have this weird feeling of being on stage. As you come out, on the back wall, a Charmin cheerleader invites customers to dance c with her to a little ditty about Charmin, and there’s a little seating area. “Are people actually chillin’ in the Charmin place?” one customer asks, observing people lounging on couches. Honey, that isn’t even close to the strangest thing about this operation. If there are bags under my eyes, you can probably blame them on Conan O'Brien -- him, and 5:45 a.m. weekday reveille to take my kids to school. If I'm really using my brain, I tape (no TiVo, yet) Late Night with Conan O'Brien. But either way, I try not to miss it. So, for this trip to NYC, I called ahead to get a ticket to a taping. 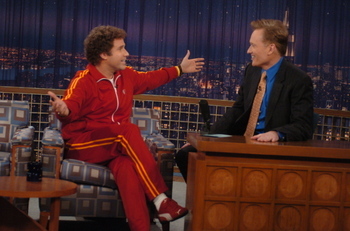 Truth be told, knowing I'd only have time to see one show taped, I debated between Conan (NBC photo by Dana Edelson, right, from a Nov. 8 episode with Will Ferrell) and The Daily Show. The selling point for Conan was that the Max Weinberg 7 is hands down the best band on late night TV, and I figured I'd get to hear more of them at a taping. I was right, though I didn't figure on sitting in the front row or having Conan goad me into a man hug with Les, the dentist from Toronto. The studio is on the seventh floor of the GE Building in Rockefeller Center. They gathered us together at about 4:20 p.m. yesterday (Nov. 8), where we waited about 15 minutes before being incrementally ushered through a metal detector and up to the seventh floor. The ushers were nice, though you occasionally got the sensation of nursery school teachers -- "We're going to put our bags on the table, open." I have long maintained that going to an event alone raises your odds of getting a good seat, and it sure paid off here. Being a single, I was ushered to a front-row, aisle seat. It made me nervous. After all, being on the front row really increases your chances of being on TV. What if my hair was messed up, or there was a booger hanging out of my nose? What if I didn't clap at the right times, or Conan singled me out for some sort of comic ridicule -- there was an incident with Drew Carey at a Virginia Beach comedy club in the late '80s (when Drew was skinny) I'm sort of scarred by. What if, like the warm-up comic said, you looked up at the monitors when you thought you were on camera and looked like a (bleep). More on the last one, later. The studio was actually smaller than I imagined, the curtained area Conan enters through is not terribly wide, and the band takes up a significant amount of the floor space in the monologue area. Conan's desk is snuggled right next to that area. There were numerous monitors for the audience to look at, which was sometimes useful, because depending where you sat, there was probably a camera in your way at some point. I don't think I actually saw any of Seth Meyers during his chat with Conan. I was always told that part of the reason TV taping tickets are free is you'll probably have an obstructed view, and that was true. But how great to be in the same room with that band. After the warm-up comic, the Max Weinberg 7 (NBC photo, below, of the band playing in Chicago with John Mayer) played, the only disappointment being regular trombonist Richie "La Bamba" Rosenberg was out. But we did get to hear trumpeter Mark Pender sing, and I really dug getting a closeup look at guitarist Jimmy Vivino's rig. If you think they sound amazing on TV, live is something else again. And while folks at home are watching Head On commercials and the like, the audience is hearing the 7 jam. Conan came out to briefly address the audience before the show, and my good seat earned me a handshake from the pale one. Then, in a very Conan-esque manner, he asked Les from Toronto for a hug. Then, he decided he wanted Les and I to hug. Thank God this was the warm-up, and not national television. There was a tentative moment, then a friendly embrace. Then Conan got Les to embrace Max, who gave him a set of drumsticks. Les gets around. Around 5:30 or so, the show got started. The biggest obstructed view disappointment was not having a good view of Conan's little tuck and jump when he comes out. It is to Conan fans what Johnny Carson's golf swing was for his followers. If I ended up on TV, it was because I was sitting next to a gorgeous blonde woman in a black dress. Conan commented that usually folks show up for his show in jeans and backward baseball caps, so he repeatedly complimented this woman for dressing up. I caught myself in a no-no during one of those moments, glancing up at the monitor like a dork, while the camera was on us. The saving grace would be that if I am sharing a frame with her, no one was looking at me -- BTW, the cameras probably missed her great red shoes with severe pointed toes and a red bow on the ankle. Whenever the show has a commercial break, Conan pops up and chats with folks during the time, which seems to be the same length as an actual commercial break. The musical guest was TV on the Radio (photo, right). Initially, it seemed they would play back behind the proscenium arch. But then the whole stage rolled out for them to play in the monologue area. Good band. Conan watched intently, tapping his foot as they played. One thing I love about Conan is he books a lot of bands that remind me of edgy, emerging groups I saw on the old Late Night with David Letterman in the '80s. There's a spirit of that late night classic Conan is keeping alive. After the closing music for the show, Conan joined the group to wail for a moment on a song that had lyrics like, "Here's the song at the end of the show! The song you never hear on TV." He seemed to be having fun, and the fun rubs off, whether its on TV, or in the studio. At least last night, I didn't have to stay up until 1:35 to see the whole show. Well, I'm probably going to go and watch it now. After seeing the hit revival of A Chorus Line Wednesday night, I had a unique second look Thursday afternoon. Lexington's Lyndy Franklin is a swing understudy, meaning she is covering several different roles in the show. Each week, there's an understudy rehearsal, which Aaron Lee Fineman (who took the photo of Lyndy and the cast, above) and I got to sit in on. Particularly at this level, it was one of the most interesting ways I have ever seen a production: Twenty-four hours after watching the principal cast, I got to see all but one of the parts (Lyndy's Bebe) played by different people. It definitely put different spins on numerous characters, though most of the key moments still rang true, such as Paul's story of his previous life in a drag revue and, of course, Diana's rendition of What I Did for Love, a song that has a tremendous impact on anyone who loves his life. Trust me, if you go see the show and Jessica Lea Patty is playing the part of Diana that night, the Chorus Line classic will still bring you to tears. Watching the understudies seize their roles, it was easy to contemplate how close most of these actors are to the characters they are playing. An interesting thing was that in the understudy rehearsal, Lyndy played two parts: Bebe and Kristine who can't sing. It was really fascinating watching her constantly switch parts, including going straight from At the Ballet to Sing! ~ Right before Chorus Line rehearsal, I found out the lead in High Fidelity, which opened last night, is Will Chase from Frankfort. I'm hoping to catch the show tonight and catch up with Will soon to chat about it. ~ When I found -- no surprise -- that there were no tickets left for last night's High Fidelity opener, I had this insane notion of packing it in and spending the night in my cozy room. Then I remembered it would be a sin to squander a night in New York holed up in my hotel room, and I went and got a ticket for Grey Gardens. Glad I shook off the laziness. 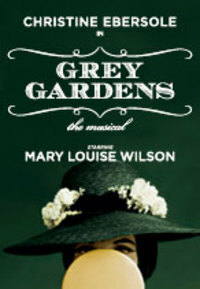 Grey Gardens doesn't quite convey the spirit of fierce individualism that the program notes attribute to the Edies, a mother and daughter, who were close relatives of Jacqueline Kennedy and tumbled from the pinnacle of New York society in the 1940s to living in squalid conditions in their 28-room mansion. In 1972, the Suffolk County Board of Health condemned the estate, which was in disrepair and overrun with cats. The lives of the ladies were chronicled in a revolutionary 1974 documentary by Albert and David Maysles. The musical has some great tunes and fantastic sets. Christine Ebersole alone is worth the price of admission to see her play the elder Edie in the first act, set in 1941, and the daughter in the second act, set in 1973. It gives the Tony Award-winner a chance to pull off a theatrical feat and also highlights the similarities between mother and daughter, regardless of how badly the daughter wants to separate herself from her home. Calls to home yesterday told me that Kentucky got a little snow, and it's really cold. The bottom dropped out here while I was in Grey Gardens, and apparently New York could get a little snow tonight. Well, off to bed. Tomorrow morning, I'm supposed to have breakfast at a Rent-head landmark. 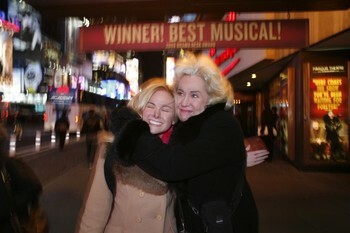 ~ Honestly, we did not tell Lorna Bundy-Jones not to go see her daughter's monster billboard for Legally Blonde in Times Square. But, though she got to town Monday, Lorna dodged seeing the new ad with a giant Laura Bell Bundy until Wednesday, allowing our photographer, Aaron Lee Fineman, to capture mom's initial reaction. Think she's proud? I have to wonder if there's any omen in the Drowsy Chaperone marquee Aarron just happened to catch Laura and Lorna under. ~ Aaron shot the new photo of me up in the left-hand corner while setting up a portrait of Laura for the Dec. 17 Herald-Leader. Funny thing is, when he was shooting Laura, there were people driving by who told her she was beautiful. I'm sure that when Aaron was shooting me, as a stand-in to get the shot ready, people were saying, "Why's he taking a picture of that guy?" ~ I came to town in need of a new flash for my old-school SLR. After a few salesmen in Times Square shops blatantly tried to rip me off, I asked Aaron where I should go, and he directed me to B&H Photo at the corner of Ninth Avenue and 34th Street, calling it the "Wal-Mart of camera stores." Was it ever, except there are Wal-Marts everywhere and one B&H. It was an amazingly huge maze of a store with everything you could want for a camera and, near as I could tell, very honest salespeople. Between two of them, I walked away with a lot more than I ever thought I'd get for the money I spent. 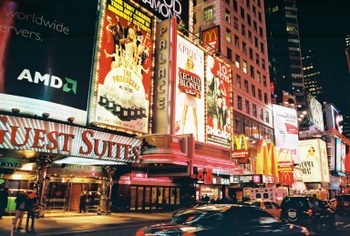 ~ After shopping and a little stroll through Herald Square, it was off to Legally Blonde rehearsals. 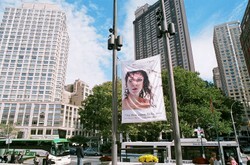 They take place in a spacious seventh-floor studio, with windows overlooking Times Square. Near the end of a rehearsal, Laura and the girls who play her Greek chorus of sorority sisters had just gotten the number they were working on. It looked like they had been going at it for months. The first sight I caught of Lorna, she was holding book writer Heather Hach's new baby. Seems it's not just Laura -- anyone in Lorna's sphere gets motherly treatment. ~ Just before meeting with Laura yesterday, I got a call from Lyndy Franklin. Lyndy, daughter of Lexington Opera House manager Luanne Franklin, is a swing understudy, covering four roles, for the new production of A Chorus Line. Anyway, it was just our luck that last night, when we had tickets to Chorus Line, Lyndy went on in the role of Bebe. It was a heckuva a show, still seeming quite groundbreaking for a piece that premiered three decades ago. Anyway, it's time to get to bed so I can be up to catch the No. 7 train out to Queens to visit Lyndy. Well, we caught The Color Purple on a very good day. 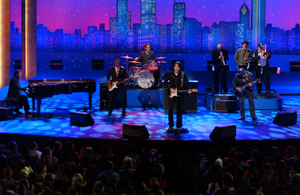 Yes, the Broadway Theatre was packed last night (Dec. 5) for a rousing and moving performance. But before that, the show came in a double winner at the 18th Annual Gypsy of the Year competition, the grand finale of a six week fund-raising effort for Broadway Cares/Equity Fights AIDS. The event itself is a lot of fun as the casts of 16 Broadway shows put together skits ranging from the silly to the sublime. The cast of Beauty and the Beast, for instance, shot inside a little bit with a vision of a new Disney musical: a quite overdone and inappropriate Pocahontas: An Absolutely True Story. The Hairspray cast, including Diana DeGarmo, re-imagined I Can Hear the Bells as a gay love at first sight, with Tracy Turnblad eventually ripping open her blouse in a fruitless attempt to re-attract Link. And two guys from Spamalot did a news segment that skewered Broadway the way Jon Stewart skewers politicians. But then, there were more thoughtful, moving sketches, including the cast of Rent giving the stage to a teen program the show has developed, and a number by the cast of the now-closed The Times they are A-Changin' that was one of those things I don't think I quite got, but I want to see again and again. The Color Purple won the fund-raising award for the campaign that raised nearly $3 million overall, between Broadway, off-Broadway and touring productions. The show also won the talent competition among the 16 shows, thanks in no small part to Lebanon native JC Montgomery and Lexington native Eric L. Christian. They were part of the soulful When, Where, Why Will I Go?, which took top honors in the competition, whose judges included Jill Clayburgh and Cynthia Nixon. The presenters included Christine Ebersole and Martin Short (I still don't know whether I want to see Fame Becomes Me, Short's Broadway show). Then, it was off to the theater for a 7 p.m. curtain. Backstage, Christian was leading a listening party for the just-released Dreamgirls movie soundtrack -- thumbs up for Jennifer Hudson, not so much for Jamie Foxx. It was good to start the day opening The New York Times and seeing a big article on Georgetown and the Toyota factory. Now, despite being in the City That Never Sleeps, I'm off to bed. Tomorrow is Blonde day. Live, from New York, it’s Copious Notes. Excuse me for indulging in that one. But we are in The Big City this week, and I mean big. How big? Well, I walk down the block from my hotel, and there’s an enormous Laura Bell Bundy overlooking Broadway. Interesting thing about this little corner of Times Square is that if you looked to the left of the billboard for the Lexington native’s new show, Legally Blonde, you see the huge ads for two other shows LBB has touched, Hairspray (in which she created the role of Amber von Tussle) and Wicked (in which she was the star replacement for Kristin Cenoweth as Glinda). And if you notice the Chorus Line billboard (right next to Hairspray, behind a traffic light), that features Lexington native Lyndy Franklin in her Broadway debut. If I had a wider-angle lens, I could have gotten The Color Purple marquee in the shot. That cast boasts three Kentuckians, led by Lebanon’s own JC Montgomery, a Broadway veteran. That’s why we’re here: to talk about some hometown kids made good. Kander & Ebb told us that if you can make it here in New York, you can make it anywhere. And when you walk the streets and see the sheer number of shows, the sheer number of people in this city, you get an idea of what an accomplishment it is to get a part here, to say nothing about being the lead in the “it” show of the season, which Blonde appears to be. 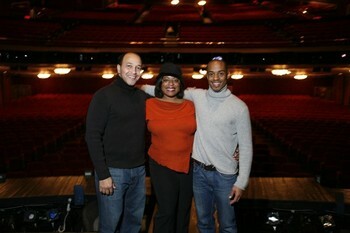 So, today (Dec. 5) we get started, visiting with our Color Purple stars and seeing the show. 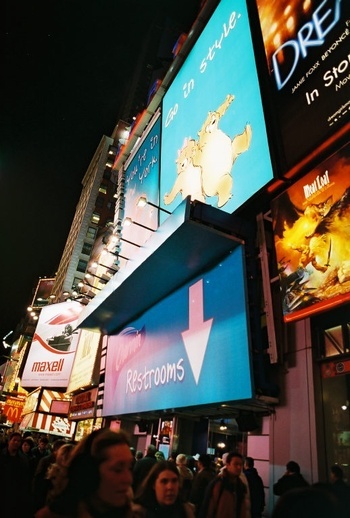 In coming posts, we’ll also soak up a little Christmastime in The City, check out the now-famous deluxe Charmin Times Square restrooms and bring you some of the other things that make being in New York such a big deal. ~ Props to Lexington's own Blue Grass Airport for providing free WiFi service for its customers. When I got to Chicago's O'Hare International this afternoon, they wanted $6.95 a day for access.